Butler’s men’s basketball team huddles up. The Bulldogs picked up their second Big East win. Jimmy Lafakis/Collegian file photo. The Butler men’s basketball team is now 2-3 in Big East play after a road win against the DePaul Blue Demons. 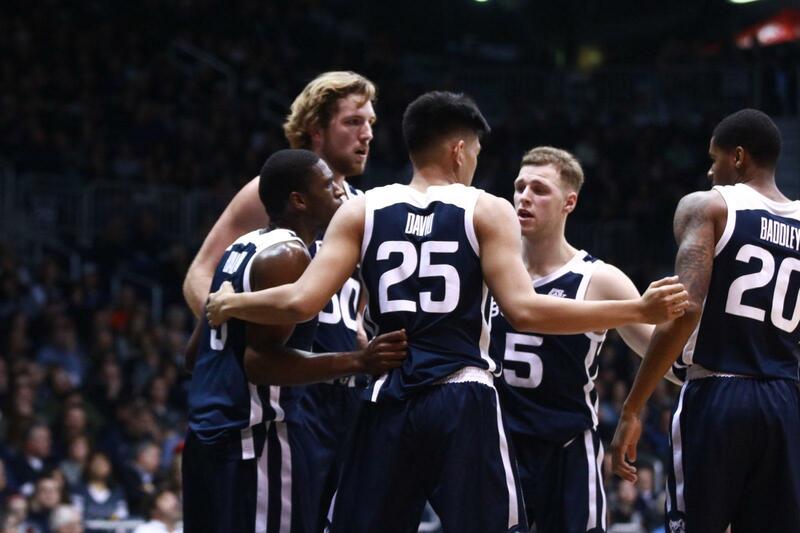 Butler scored 51 points and shot 71 percent from the field in the second half to defeat DePaul 87-69 and win its 19th consecutive game in Chicago. Here are three takeaways from a much-needed victory. 1. Butler dominated the 3-point line and won the rebounding battle. Coming into this contest, Butler was shooting 36.7 percent as a team from beyond the arc while DePaul entered the game shooting 31 percent as a team. The Blue Demons had an equally large advantage on the glass as Butler ranked 320th in the country in rebounds per game. The Bulldogs won the battle from distance, shooting 13-for-28 while holding DePaul to just 33 percent shooting from beyond the arc. The Bulldogs were expected to shoot better than DePaul but the Bulldogs also outrebounded a Blue Demon team that ranks top 50 in the nation in rebounding. Despite giving up 11 offensive rebounds, the Bulldogs out rebounded DePaul 31-19 on the defensive end of the floor and pulled down six offensive boards of their own. Butler limited DePaul’s rebounding advantage and overwhelmed them from the 3-point line. 2. Sean McDermott and Jordan Tucker were the ultimate floor spacers. Sean McDermott and Jordan Tucker went 9-of-16 from three and combined for 36 points. McDermott scored 14 straight points for the Bulldogs in the first half and Tucker knocked down four of his five threes in the second 20 minutes. Their ability to shoot opens up the floor for Kamar Baldwin on the offense end. It’s not a coincidence that Baldwin had arguably his most complete game of the season scoring 17 points, dishing out five assists and pulling down 14 rebounds. When the opponent’s defense has to worry about Butler’s shooters, Baldwin has the space to create on the offensive end and get into the middle of the defense. For the first time this season, Tucker looked to be in a groove for the entire contest. He not only adds another 3-point threat, but he also has the ability to create his own shot off the dribble. This Butler offense has a whole other dimension when he’s playing well and the eight rebounds he pulled down against the Blue Demons don’t hurt either. Butler is a better team with a consistent, contributing Tucker. 3. Butler’s ball movement was phenomenal in this one. Every player on Butler’s roster is better on offense when the ball doesn’t stick. Butler assisted on 18 of its 35 made field goals. In the first half when DePaul threw a zone at Butler, quick passes and good lucks for McDermott forced them to move back to man-to-man. When Butler looks bad, they get stagnant on offense and do a poor job moving the ball. Well, ball movement was great for all 40 minutes against DePaul and it resulted in 13 threes and 58.3 percent shooting as a team.